Scribner Book Company, 9781451613698, 303pp. A memoir of Betty White's first five decades on television--as irreverent and irresistible as the beloved actress herself. Now, during Betty's sixty-first year on screen, a year in which she has enjoyed a huge resurgence of popularity, her 1995 memoir makes a comeback too. 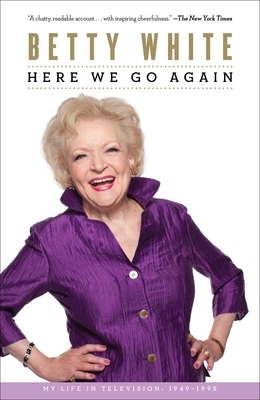 Here We Go Again is a behind-the-scenes look at Betty's career from her start on radio to her first show, Hollywood on Television, to several iterations of The Betty White Show and much, much more. Packed with wonderful anecdotes about famous personalities and friendships, stories of Betty's off-screen life, and the comedienne's trademark humor, this deliciously entertaining book will give readers an entr e into Betty's fascinating life, confirming yet again why we can't get enough of this funny lady.